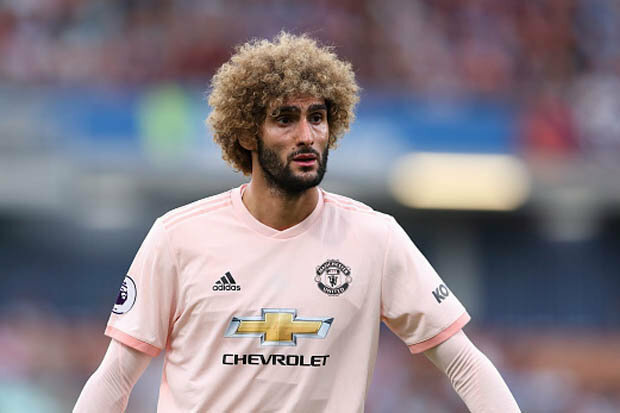 Though most fans failed to see his merit, Marouane Fellaini has gone from the fall guy to fan favorite after repeatedly influencing matches United's way in the past few outings. About 15 minutes after full-time on Wednesday night at Allianz stadium with the home fans long gone, and as the Manchester United fans being held in the visiting section continue to reminisce in the remarkable come-back to break Juventus' unbeaten run, comes game-changer, Fellaini - who has been asked to complete a warm-down routine having only featured in the final 15 minutes of the 2-1 win against the Turin outfits. What follows is a mutual appreciation session as the Belgian is serenaded throughout his solo routine, with every single one of the travelling contingent all too aware of the key role he had played in United’s comeback victory. Fellaini, in return, gives the fans a clap and a wave. For so many Reds across the world, the midfielder remains the single greatest example of where the current Manchester United are going wrong. Nobody can imagine one of the United engine rooms of years gone by having a space for somebody as cumbersome and physical as Fellaini. And with every gripe about the way in which Jose Mourinho coaches United comes the point that Fellaini is used as a battering ram more often than a slicker, silkier attacker is employed to open up the opposition defence. But time and again the 30-year-old has delivered, with Wednesday in Turin just the latest case in point. “We had no Fellaini to change the direction of the game, like we do so many times,” complained Mourinho after the 1-0 home loss to Juventus for which the midfielder was unavailable due to injury. And after the return success, it was the same player’s impact which the manager believed had made all the difference. “Fellaini gave us an option to be alive again by playing direct, by bringing the game again to the last third, and being in the last third was giving us the chance to create situations like we did,” he said on Wednesday. It is hardly the first time Fellaini has dragged Mourinho’s side over the finishing line, and the travelling United supporters needed no reminding of how important he can be as they prepare to head across town for the season's first Manchester Derby against City on Sunday. To those who spent so long singing ‘Du du du, Marouane Fellaini’ in the emptying Allianz Stadium, Fellaini is the man who has sent them home happy on numerous occasions in recent times. They are the ones who follow United come what may, who get behind anyone donning the club’s colours regardless of whether they were for or against the team selection an hour before kick-off. They know that, for all the conflict over Fellaini’s merit, few can claim to give their all for the cause quite as readily and effectively as the former Everton man. Since Mourinho arrived at Old Trafford he has thrown Fellaini on as a substitute 42 times, and on 19 of those occasions United have been chasing the game – either drawing or losing – at the time of his entrance. They have gone on to win eight of those fixtures, and in both of the big man’s last two appearances he has entered the field with his side trailing and left it having influenced a come-from-behind win. In total, United have scored 25 goals after Fellaini’s introduction in the 42 appearances he has made off the bench, with Felli himself netting five of them, and have made a net gain of 13 points as a result. What's more, he has been brought on 11 times under Mourinho with United drawing and they have gone on to win six of those games, making Fellaini odds-on to have a game-winning influence. Whatever the artistic merit of their play once they have such a threatening target to aim at, it cannot be considered an ineffective tactic. Too many so-called United ‘supporters’ seem to want an ideal world scenario or nothing at all. They seemingly would rather lose than have to justify to rival fans why their favourite team has such a divisive character in the centre of their midfield. What is Fellaini's big problem in the eyes of these supposed fans? That he is not Kevin De Bruyne? Well he is never going to be, but he can be a monumental difference-maker in his own way, and that is exactly what he has proven to be for the red side of Manchester. Those who have no appreciation for what Fellaini offers can have no right to claim to have United’s best interests at heart. Why all the groans and snipes across social media and internet forums the second his name appears on a team sheet when those at the game have no problem recognising his positive impact? Without the personality of a Paul Pogba or the ball control of Juan Mata, the searing pace of Marcus Rashford or the cool head of Anthony Martial, Fellaini will never be the fans’ favourite at Old Trafford. But he does deserve far more respect, all the same. He is, after all, as effective – and by extension, as important – as any other player in Mourinho’s squad. How many more times does he have to bail United out before he gets the support he deserves from the more global fan base? Will it take another Fellaini-inspired comeback win against Manchester City on Sunday to make the doubters accept that he does have a place in this squad after all?